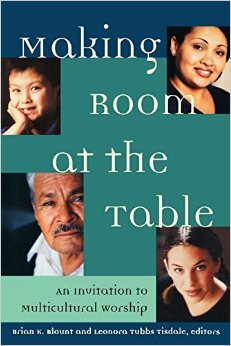 Making Room at the Table is a collection of essays sharing Christian theologians’ struggles with the 21st century’s emerging theological issue of multicultural worship. This publication is twelve essays written by current and former members of faculty at Princeton Theological Seminary. By adopting the primary metaphor of Christian worship, the Lord’s Table, the writers make an effort to answer these main questions; “How do we celebrate the Lord together by maintaining each unique cultural identity?”, “How do we keep tension between worship that is faithful to our own theological and liturgical histories and worship that at the same time is open to the transformation that can come through the engagement with many cultures?” and “How do we make worship more relevant to and inclusive of groups that have often been excluded such as youth, minorities, and other marginalized peoples? (x).” The essays are collected into three categories: biblical foundations, theological foundations, and practical theological foundations for multicultural worship. for all peoples” Isa. 56:7, NRSV). The second part, “Theological Foundation for Multicultural Worship,” encompasses theologians’ endeavors to propose ways ethnic/cultural factors can positively articulate multi-cultural and inclusive worship. Especially interesting, relying on Victor Turner’s liminality theory, Sang Hyun Lee remarks that Korean American ritual can be a milieu in which liminality as existential status (of ambiguity and in-betweenness) can positively engender creativity and transformation by liberating worshipers from the existing rigid fabric. Along with that, Mark Taylor notes that the Carribean polyrhythmic praise (a life of doxological action) as ecclesial embodiment of social liberation and resistance to imperial power in Christian worship (including their daily lives),is the matrix of Christian adoration to God. The third section of “Toward Multicultural Worship Today” contains practical theological approaches to worship for marginalized youth groups and practical-theological wisdom for multicultural worship. For instance, Geddes W. Hanson evinces the authenticity of a multi-cultural worship as not only humanity’s transcendent experience of the Divine in the Spirit’s unpredictability but also cultural vocabulary that seeks for cultivars – that is, a cultivated variety in multicultural congregations. Finally, this book concludes with Leonora Tubbs Tisdale’s insistence on multi-cultural worship’s four theological markers; (a) the praise of God and edification of the worshippers, (b) witness to the fullness of the Trinitarian God, (c) naming the eschatological view of God’s reign and (d) recovering human wholeness by/in worship. As an Asian woman, I am particularly impressed by Lapsley’s biblical interpretation on Hebrew women’s intense restrictions in the official cult of Yahweh in ancient Israel. She explains that the Deuteronomistic (dominant) position in male-defined worship condemns women’s religious practices and expression as unorthodox praxis in contrast with Jesus’ inclusive position toward peripheral and despised people – including women. Her writing challenges us to critically reflect on whether our contemporary worship might dominate or obliterate peripheral people’s cultural distinctiveness and their traditional religious practices at an (un)conscious level in terms of imbalances of (societal/relational) power. I am convinced that this volume’s theological and practical wisdom can contribute to vitalizing multi-cultural worship in North America. Absolutely, professors who have to teach multi-cultural worship in class or pastors who ought to construct multi-cultural worship can take theological and practical-theological insights from this publication. In addition to that, this book, I think, is a good starter to initiate further intercultural dialogue and interdisciplinary conversations with diverse ethnic groups’ religious practices, in the academy, for the sake of authentic multicultural worship.